*1955 in New Delhi / India, lebt in Ungarn. 1989 "MINYÓ" Liget Gallery, Budapest / 1990 "T?NC" Creative Move Studio, Budapest / Fotogalerie Wien, with J?nos Vetõ / 1991 "SUNYI" - ?jlak Group Gallery with Tibor Szemzõ, Sound Exhibition –Light koncert, Budapest / 1993 "HUNYÓ" - Óbudai Cellar Gallery, Budapest / Mala Gallery, Warsawa / 1994 Bolt Gallery, Budapest / 1999 „The House and the Garden” - Liget Gallery, Budapest / In the Opening: Light-Bicycle premiere / 2000 Budapest "I Love Paris…" - Bazovsky House. 1989 "M?s Kép" Ernst Museum, Budapest / The First East-West Photo Conference, Wroclaw / 1990 Ernst M?seum, Budapest / Center of Contemporary Art, Warsawa / 1991 Muecsarnok, Budapest / 1993 ART EXPO, Budapest / "TRANSIT", Kassel / 1994 ART EXPO, Budapest / Bolt Galeri – The First Exhibition, Budapest / ”Csoportkép”Vigadó Gallery, Budapest / Lehetne....”Mozs?r Muehely Galéria, Budapest / ”Filo Zoo” - Galeria Artoteka, Int. 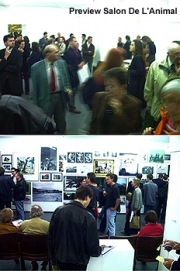 Photo mont, Bratislava / 1995 ART EXPO, Budapest / International Photo Exhibition,Soave (I) / 1996 ART EXPO the Bolt Gallery exhibition, Budapest / Vigadó Gallery,Budapest / International Photo Exhibition / Slovakia, Bratislava / 1997 Galerie Vrais – Contemporary Hung. Photograph, Lyon (F) / Contemporary Hung. Photograph, Berlin(D) / Contemporary Hung. Photograph – First Team, Pécs (H) / 1998 FOTOHÉT, Iparm?vészeti M?zeum, Budapest / 1999 FOTOHÉT, XXL TRAFÓ, Budapest / FOTOHÉT, XXS Bolt Gallery, Budapest / Subjective Photo in the „L?TV?NYT?R”, Diszel (H) / 2000 ART - siders , Cellar Gallery, Óbuda, Budapest.